China has started searching its territory for missing Malaysia Airlines flight MH370, while Australia has narrowed its search area in the south. Efforts to find the aircraft are focusing on two vast air corridors north and south of the plane’s last known location. China said no evidence of terror links had been found in Chinese passengers. The Malaysia Airlines plane went missing on March 8 with 239 people on board. Some 26 countries are involved in search efforts. Search efforts are focused on two corridors – one stretching from the border of Kazakhstan and Turkmenistan to northern Thailand, and another from Indonesia to the Indian Ocean. Investigators are looking into the possibility that the aircraft’s crew – or other individuals on the plane – were involved in its disappearance. Chinese Ambassador to Malaysia, Huang Huikang, said that search and rescue operations in the Chinese territories of the northern corridor had begun, Xinhua news agency reported. Based on background checks, there was no evidence to suggest that the mainland Chinese passengers on the plane were involved in hijacking or launching a terror attack, Mr Huang added. Meanwhile, the Australian Maritime Safety Authority (AMSA) said it had narrowed down its search area in the southern Indian Ocean based on satellite data and analysis of the aircraft’s possible movements. However, AMSA said the search area was still vast. “A needle in a haystack remains a good analogy,” AMSA Emergency Response General Manager John Young said, adding that there was a “difficult” task ahead. “The sheer size of the search area poses a huge challenge – the search area is more than 600,000 square kilometres [230,000 sq miles],” he added. Late on Monday, US officials said the US navy ship USS Kidd had been taken off the search because the enlarged search area meant that “long-range patrol aircraft” were “more suited” to the mission. The move was made “in consultation with the Malaysian government”, officials said in a statement. USS Kidd had searched the Andaman Sea but found “no debris or wreckage associated with an aircraft”, they added. The US says it is using patrol aircraft including the P-8A Poseidon and P-3C Orion to continue search efforts, with the P-8 taking part in search efforts in the south corridor. 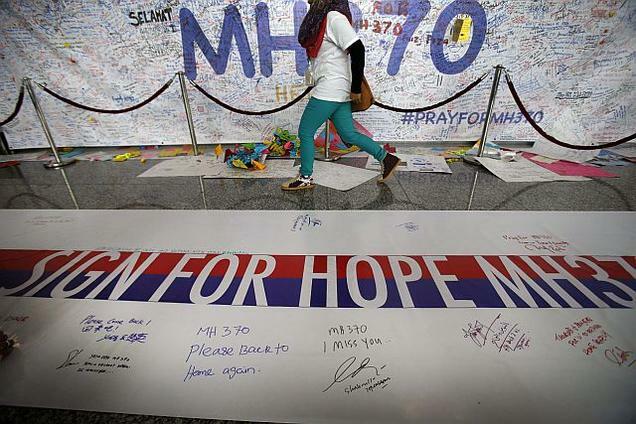 A transmission expected 30 minutes later did not come through, Malaysia Airlines Chief Executive Ahmad Jauhari Yahy told reporters. Officials believe the communications systems were deliberately disabled. Several countries have already rejected the suggestion that their airspace might have been breached.